You know Chris Gayle….. he is not only an explosive batsman but also an explosive celebrator. We Indians love him as much he loves India. Gayle has been extremely active in social media after KXIP purchased him recently. 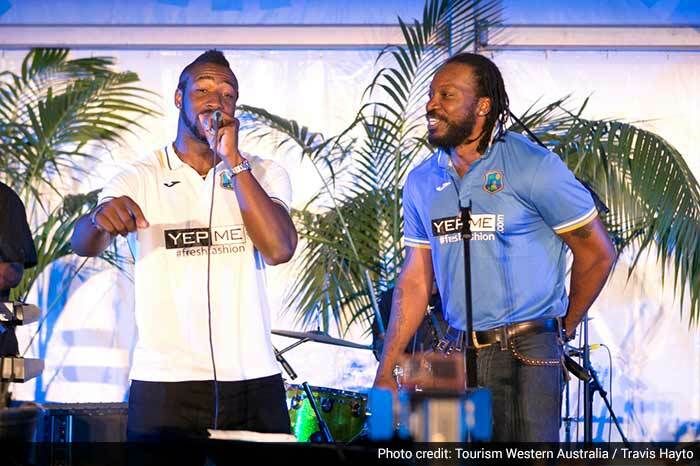 Practising with his Jamaican teammate Andre Russell in the nets, Gayle started banter with him by saying, “This Knight Rider player can’t be a Punjabi man”. But you know, once a Punjabi always a Punjabi! During the practice session, Russell said that he will do Punjabi ‘bhangra’ dance after hitting a 6 against Gayle. But interestingly it happened the other way round as Gayle dismissed Russell and celebrated by patting his thigh and showing off his mustache in full Punjabi style. The coming IPL edition will start from April 4. Gayle’s IPL career began with KKR in 2008, followed by Royal Challengers Bangalore between years 2011 to 2017, and now KXIP. For the first time since 2011, Gayle will be representing a different team in the tournament’s history. Andre Russell who is an integral part of the Kolkata Knight Riders team in IPL was retained by the franchise prior to the auctions. On the other hand, Gayle remained unsold in first two rounds of the auction and finally got bid by KXIP in the third round. Whatsoever, we all know that the 38-year-old Gayle holds a reputation of being one of the most lethal batsmen in the 20-20 format and has ability to damage any bowling attack on his day. These Bollywood actors were never seen this angry before!